DoublExit Building Emergency Escape System is a leading and innovative company. The company core business is the development and manufacture of safe and innovative evacuation systems that will provide solutions in times of emergency. A deep understanding and in-depth analysis of emergency situations are an essential part of the company’s development process. The DoublExit team is committed to excellence, supplying totally effective and reliable products. The company’s products are recognized and certified worldwide. DoublExit is part of a leadership process of recognition and standardization of external evacuation from multi-story buildings, member of ASTM International committee E06 and recognized by certification and fire safety institutes around the world. Can all of this be done? A team of experienced engineers and managers undertook this challenge after 9/11. They came up with a unique, versatile solution that meets all requirements and tests. 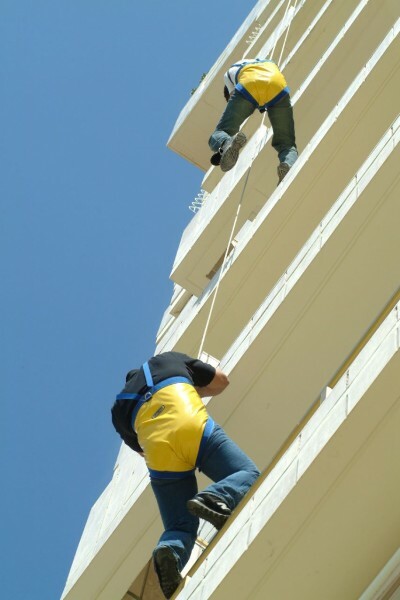 The Doublexit system has been designed to facilitate safe, effective and efficient rescue in order to save as many people as possible trapped in high-rise buildings. The rescue process must be performed from the building interior to the exterior. The DoublExit emergency escape system provides a cost-effective, safe and easy to use solution that does not require any outside assistance or prior training - and it can be used repeatedly. An original Israeli invention (Pat No. 71719). OMER 1 is a Professional Descender with quick release mechanism that was developed for use by SWAT teams, Counter Terror and Special Forces around the world. Its uses include: Rappelling, Rescue and Military applications. Mr. Barzilay, as the head of the development program of the C.T.U, was part of An investigation for some Operational events in which combatants were killed and wounded while Rappelling. Those events, led Mr. Barzilay to the development of a globally known system – The OMER 1, A Professional Descender with quick release mechanism that was developed for combat with two hands with full confidence for the combatant. Like many others, Mr. Barzilay View the horrible pictures from the events of September 11 when people had to jump from windows as a result of a terrorist incident and fire, and that led him to develop the DoublExit.